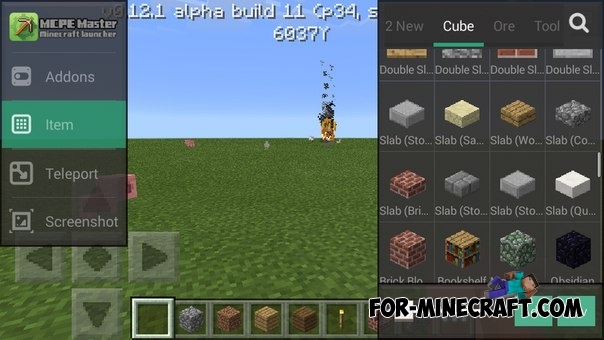 This is a new and better launcher for Minecraft Pocket Edition which will allow you to edit your inventory, change the game mode, change ur experience level, and in addition you can install mods, maps, textures, and skins during the game. 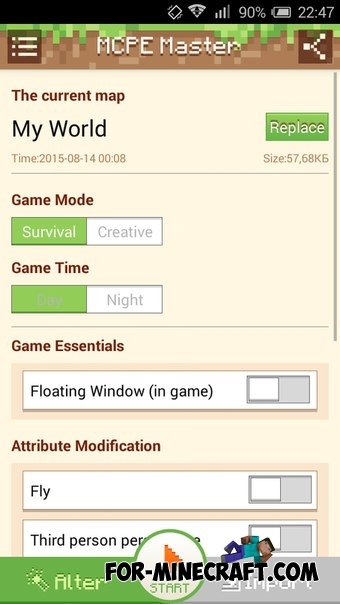 This is the useful and very convenient application for editing your world of Minecraft PE. Convenient, simple, and functional launcher with the ability to run the game with integrated TooManyItems. The ability to change the inventory. Change the time in the world. Add / remove the mobs. Download addons / skins / textures / maps and install them right in the game. Install mods, maps, skins, and textures. Run MCPE with cleaning RAM. Open the MCPE launcher and click on the Maps buttom in the main menu. Now, choose the liked map and click on download icon on the right side or go to the full post and there click on the "Download" button. Wait for the download to start and click the "Start Game". The launcher will automatically open this map. Support for Minecraft PE 1.9. Support for Minecraft PE 1.8. Floating windows support in MCPE 1.8. Support for Minecraft PE 1.6/1.7. Floating windows support in MCPE 1.7.x. 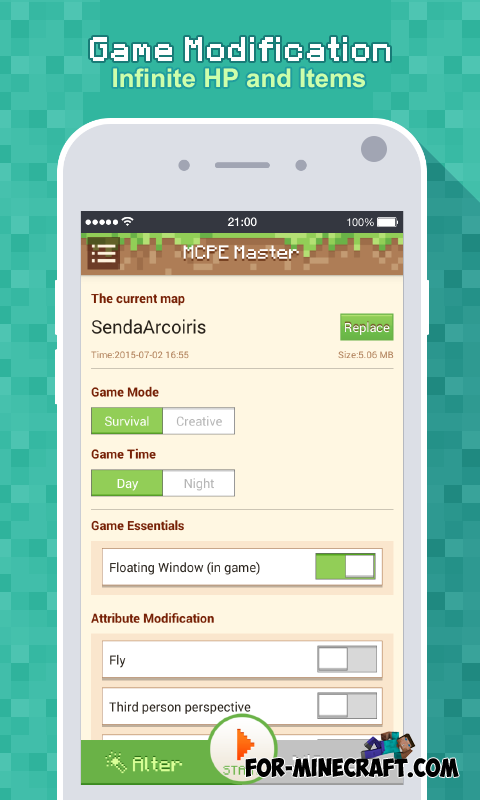 Support for Minecraft PE 1.5. Updated Master Guns Mod (download separately). Added new structures for instant construction. Support for Minecraft Bedrock Edition (MCPE) 1.2.10. Special resources are available to all users. Compatible with Minecraft Bedrock 1.2.6. 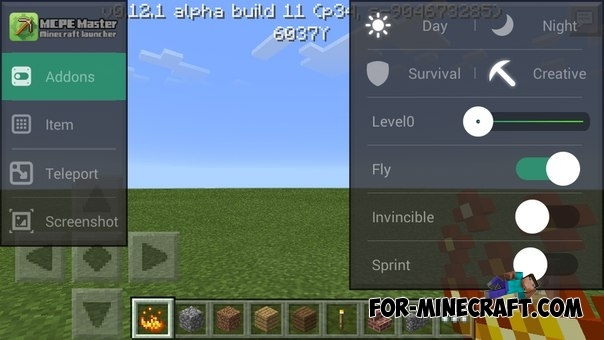 Works on all versions of PE, 1.1 inclusive. Support for Minecraft PE 1.0.4.1 and previous versions 1.0.X. Now it is possible to install addons and texture packs through the application. Floating 1.0.4 window and bug fixes. Support for Minecraft PE 0.17.0 Beta. Support for MCPE 0.16.0 (Beta and release versions). Added Win10 interface for Minecraft PE 0.16.0. New theme - Mystery Halloween. Resource filter to find and select items. 50+ new items have been added in version 1.2.12. Time can be stopped at any time. Support for MCPE 0.13.1 and Android 6.0. Official support for MCPE 0.13! Added new items of 0.13! Added quick screenshots of the game. Support .JS scripts will be realized in the next version. Change the weather on your taste! Set spawn points with a floating window. Compatible with MCPE 0.12.1 Build 9-11. You can add items to your inventory using fast window of changes of world.